Jane Jacobs. Daniel Burnham. Lewis Mumford. James Rouse. While not all planners, these names are among those select few readily recalled by most planners when asked to identify our profession's most important progenitors. Dr. Homer Hoyt is one often overlooked individual whose name should be added to this list. In celebration of National Community Planning Month in October, Dr. Terry Holzheimer, Director of Arlington Economic Development in Arlington, VA, and former Economic Development Division Chair, made a community presentation about the life and work of Dr. Homer Hoyt. I had the pleasure of attending the lecture, which was also attended by Dr. Hoyt's son, Michael. While Dr. Hoyt was a University of Chicago trained economist, life-long real estate investor and not a planner, he pioneered many important theories and tools that in common use by planners today. Dr. Terry Holzheimer presenting The Life and Work of Homer Hoyt. Dr. Hoyt, born in 1895 to a college-educated single mother, grew up in less than secure circumstances in rural and poor areas in the present-day Kansas City region. Although he experienced difficult circumstances in childhood, his mother instilled in him the independence, a strong work ethic and an understanding of the value of education. Dr. Hoyt earned a BA and MA from the University of Kansas at age 18, and four years later completed a law degree at the University of Chicago. In his twenties he worked at for short periods at several firms, and taught law. During the 1920s Dr. Hoyt moved to Chicago to invest in real estate to take advantage of the city's booming real estate market, from this point forward Dr. Hoyt remained an active investor in real estate for the rest of his life. Dr. Hoyt's personal experience with real estate losses following the stock market crash of 1929 and the subsequent Great Depression, raised his interest in how real estate values related to economic cycles. He became a doctoral student in land economics at the University of Chicago, and in his dissertation focused on examining Chicago's real estate values through its past five economic boom and bust cycles. (His dissertation was published in 1933 as One Hundred Years of Land Values in Chicago). 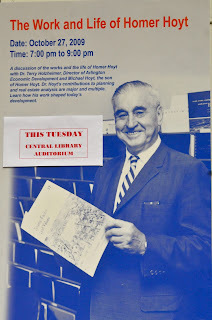 Dr. Hoyt's dissertation research at the University of Chicago served as the catalyst for a lifetime of critical discoveries in planning and real estate economics. From 1934-1940 Dr. Hoyt worked for the Federal Housing Administration, where he developed a methodology to asses which areas of cities were the best for investment by mapping a city's housing stock using various socio-economic indicators (housing age/value, race of tenants, owner occupancy, overcrowding etc.). These exercises led to his development of Sector Theory, sometimes called the Hoyt model, which postulates that urban growth occurs along transportation arteries, and that zones are not rigid in form and can penetrate one another. 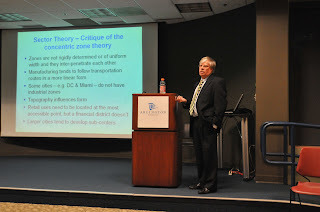 All planners are al so familiar with another Dr. Hoyt innovation, Economic Base Theory. Once Dr. Hoyt developed a better understanding of how cities grew, he wanted to understand why they grew. He theorized that regional economic growth was dependent upon the regional population's ability to produce more than then can consume, that is the health of a region's export-based industries. Hoyt realized that demand for land (and thus land values), was dependent upon the economic strength and sustainability of a regional economy. While Dr. Hoyt's early career was spent examining cities in the pre-World War II era, he proved very perceptive about the changes in land values that would occur due to the mass suburbanization that occurred after the War. In the late 1940s Dr. Hoyt became turned his attention to suburbanization and suburban shopping centers, developing a hierarchy of shopping centers that is still used today. He successfully invested in once regionally peripheral lands that became our nation's first suburbs in the post War era. He founded a consulting firm, Homer Hoyt Associates, in 1951 to provide professional research services to real estate investors, at a time when such services were really first emerging. In his suburban shopping center and other post War work, he developed modern real estate market analysis by applying measures of supply and demand to individual sites or markets. Dr. Hoyt's contributions to planning knowledge form an important basis for much of our economic development planning work today. He had an amazing career that incorporated both work as a real estate consultant and investor and academia. One aspect of his life's work that I find particularly amazing is simply how much legwork he had to put into his getting his data and how he translated his data into practical and important theoretical insights. I certainly take for granted the ease of accessing quantitative, current and historical socio-economic data, the readily available GIS tools planners use to understand our environment. At the time when Dr. Hoyt began his career good quantitative data wasn't just a click away, and he actually pioneered the idea of representing data geographically, with maps! While working on his Ph.D. dissertation he spent hours in the Cook County Assessor's Office pulling data together from records the likes of which we can only imagine. (There was an additional reward for these efforts however, as according to his son Michael, Dr. Hoyt met his wife at the Cook County's Assessor's Office). Reflecting on Dr. Hoyt's work, my thoughts turn to today's planning innovations, and how planning practitioners are currently contributing to our broader understanding of our field. In recent months I've begun learning about emerging technologies that have the potential to transform planning practice. Perhaps some these tools will help us achieve a new understanding of the 21st century city and its economic base. How do you see the relationship between emerging technologies, planning practice and planning theory today? Beauregard, R. (2007). More Than Sector Theory: Homer Hoyt's Contributions to Planning Knowledge. Journal of Planning History, 6(3), 248-271. Strategic Thinking with Maury Seldin, Homer Hoyt Institute blog. Might a copy of this presentation, or any notes from it, be available? This Georgist would welcome a copy!